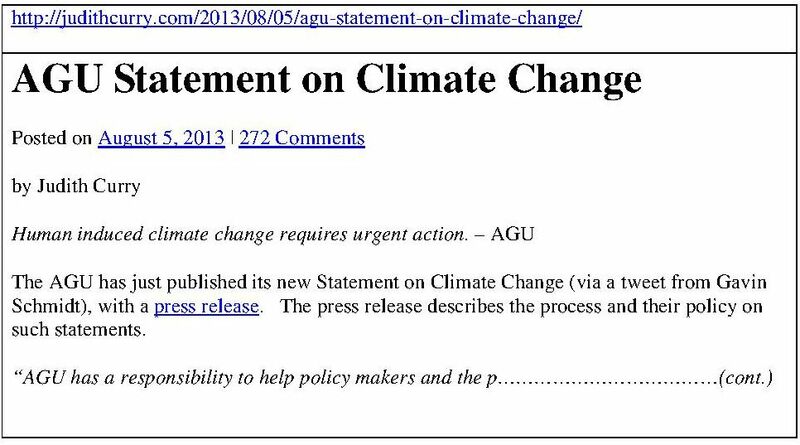 To previous essay: "Roger Pielke Sr and Climate Definition"
On the other hand it represents the state of climate science. 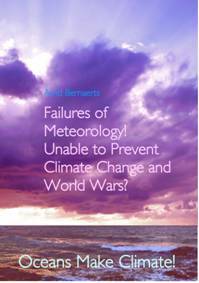 Neither the World Meteorology Organisation or other scientific organisation or institutions use a different terminology. 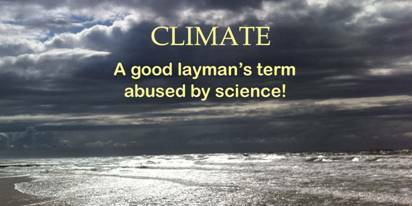 Is climate science incapable to define what they are talking about? An analysis of the term CLIMATE as defined in the Glossary (left column) show big flaws (right column). as the average weather ,. x) Kincer, J.B., 1935; Monthly Weather Review, 63, 342-344, available online at: http://docs.lib.noaa.gov/rescue/mwr/063/mwr-063-12-0342.pdf. ‘Weather’ consists of several hundred parameters, see . - IPCC-Glossary says:. The climate system is the highly complex system consisting of five major components: the atmosphere, the hydrosphere, the cryosphere, the lithosphere and the biosphere, and the interactions between them. The climate system evolves in time under the influence of its own internal dynamics and because of external forcings such as volcanic eruptions, solar variations and anthropogenic forcings such as the changing composition of the atmosphere and land use change. Indeed, a science which is not able to define the central terms they use: weather and climate, and is unable to name the oceans as the most potential driver of atmospheric processes, will fail to advise politics and the public fair, competent, correct, and thoroughly. http://www.aip.org/history/climate . Available as book: HARVARD UNIV. PRESS, 2003. When change is discussed, the specific component that is being discussed should be presented, such as an increase in annual averaged surface air temperatures, a decrease in the length of growing season etc. 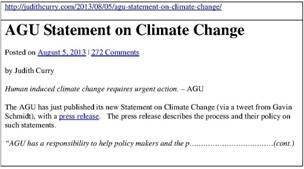 Phrases such as “changes in regional and global climate statistics” could be used. This assumption is wrong. Regardless what kind of regional or global weather statistic is at stake, it is necessary to name the “specific component” individually and precisely. Assuming that one or several statistical components are able to make-up a weather or a nature “system consisting of the atmosphere, hydrosphere, lithosphere, and biosphere” would always result in a failure. “Climate” is a meaningless term, and scientifically incomprehensive in what ever combination with other words. 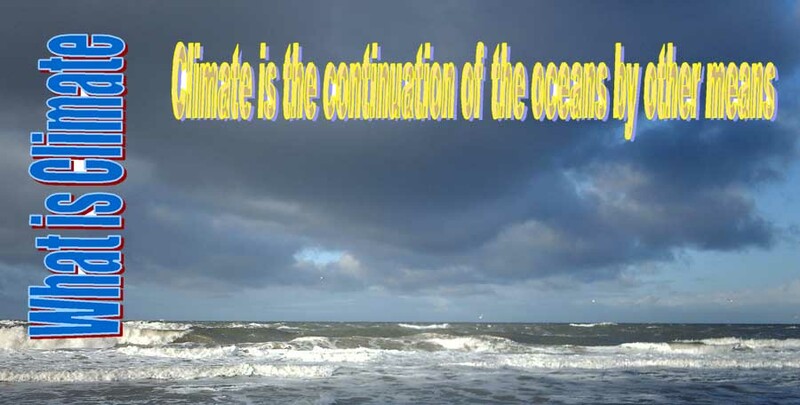 � Climate is defined here as the statistical description of all the elements in the climate system (including the atmosphere, ocean, land surface and cryosphere), including both the mean state and any variations over time. � Climate change is defined as a shift in the statistical description of climate. 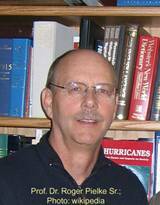 Back to "Roger Piekle Sr"
Failures of Meteorology! Unable to Prevent Climate Change and World Wars? 232 pages, about 150 figures. Cold Pole over Skagerrak Winter 1940/41. Occupation of Norway contribute to extreme winter.